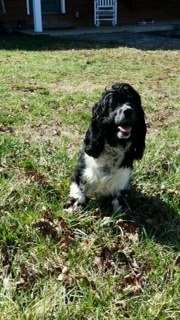 Hall County Animal Shelter Program Coordinator Cindy Langman said a Hall County citizen discovered the dog, which appeared to be injured and abandoned, at his apartment complex earlier this month, so he took the 1-year-old Spaniel to the shelter. Langman said Hall County Animal Shelter Veterinarian Dr. Meghan Seabolt examined the dog and found a wire had been wrapped around her back, right leg. "It was badly infected, non-functioning and needed to be amputated," she said. "So Dr. Seabolt performed the surgery, which was a tremendous success." Langman said the dog, appropriately named "Hopscotch," recovered quickly under the care of one of the shelter's veterinarian technicians. "Samantha Dalton fostered Hopscotch at her farm, and within a few short days, she was walking, climbing and running around outside with the other resident dogs," she said. After making a full recovery, Langman said Hopscotch was adopted by a Cocker Spaniel rescue group out of Alpharetta, where she is currently in foster care and awaiting adoption. Anyone interested in adopting Hopscotch is asked to contact Life's Little Paws through their website, www.lifeslittlepaws.com. More information about the Hall County Animal Shelter, including a complete list of its adoptable pets, can be found at animalshelter.hallcounty.org.